The Ackworth Hoard was found buried in a garden in Ackworth last year inside a pot made locally in Wrenthorpe. It is made up of 52 gold and 539 silver coins and a single gold ring. Dating to the Civil War, it is the only hoard known from the Wakefield district and has a distinct Royalist association. Wakefield Council campaigned to keep the Ackworth Hoard in the district. Fundraising has ensured that this amazing treasure will remain in Yorkshire. The Heritage Lottery Fund awarded £25,500 towards the acquisition of the treasure and a programme of associated activities so that people can learn about its importance to Wakefield and Yorkshire. Further support includes £49,000 raised from national funding, £27,000 from the Victoria and Albert Museum Purchase Grant and £10,000 from the Headley Trust. Over £2,500 has also been reached through local fundraising including Ackworth Parish Council donating £500. 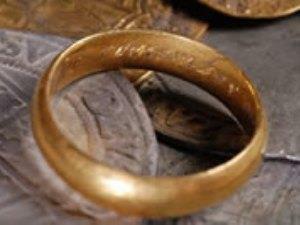 A selection of the hoard will go on display from late summer 2013. Please check with Pontefract Museum as to what is on display before making a special trip.